Find how to escape the traps and unveil a safe path. Reach the other side of the room by building a safe path. Only one interaction possibility: your head. You will need your cognitive AND your physical capacities to unveil the safe path. You will visit a succession of Room full of Obstacles requiring specific actions to be cleared. Explore and find the optimal path to collect all the VoxelKeys and unlock the Door to the next Room. 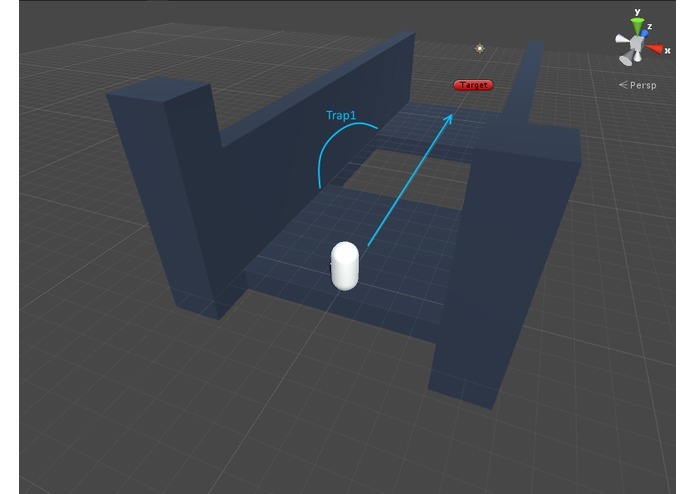 The first rooms present simple Obstacles (translation, rotation)... As you progress, new Obstacles and combination of previous ones will challenge your journey. Particularity: you perceive the world from a third person view, orbiting around each Obstacle. 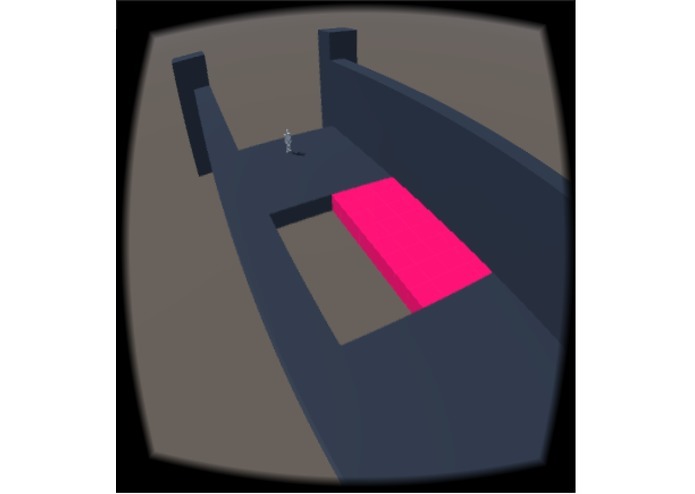 Keyword: 3rd person view, puzzle-game. The main control is your point of view! Every Obstacle is tied to it in some ways. So, look in every direction to quickly understand how to unlock the current Obstacle. 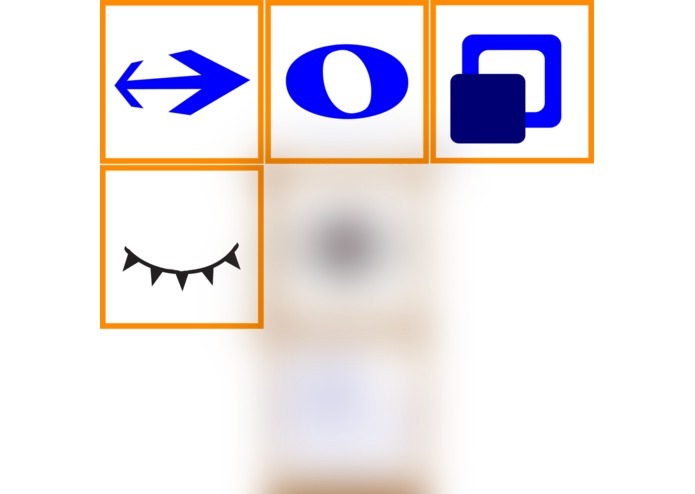 Find the correct combination and observe carefully to choose the right path and collect all the VoxelKeys. 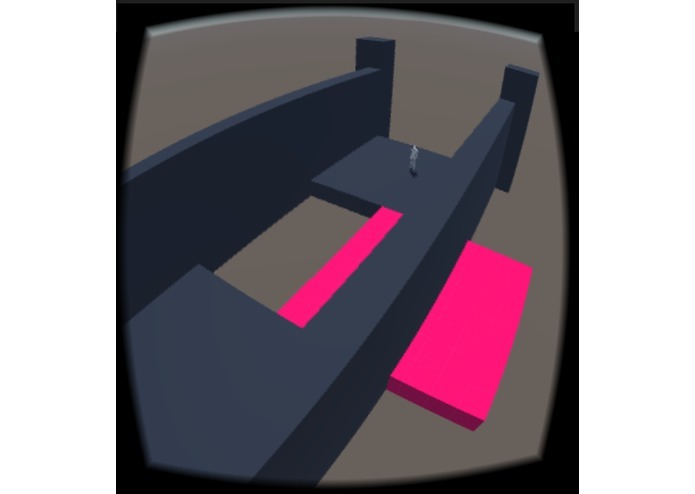 After each checkpoint, you will be teleported to the next Obstacle. 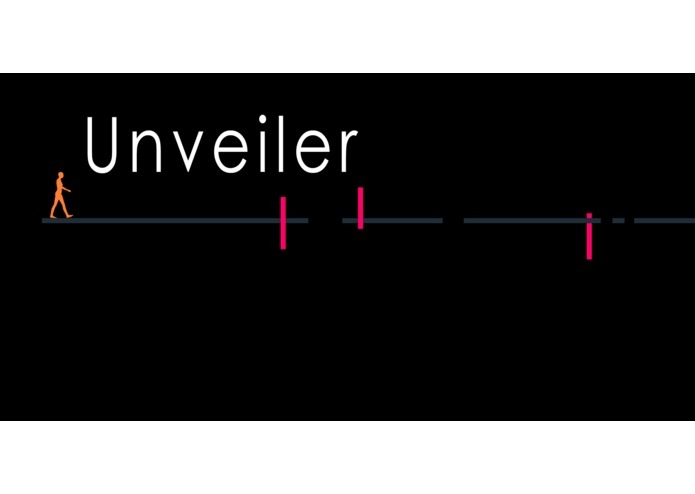 Unveiler tries to explore another VR control scheme than 1st person view. It can be played quickly only with the GearVR (no need for a gamepad). Despite the complexity of the Rooms, your point of view controls everything. Moreover, it is not using a usual 3rd person scheme. If you look on your right, you will pivot your point of view centered on a point of interest, so orbiting. Even this is not a natural scheme of visual perception, this respect the rule: a visual change results from a physical movement; thus not increasing cybersickness. This world is not logic. Not a first person view experience. M3 is done, it was a tight deadline for Unveiler, but hopefully this boosted the development. 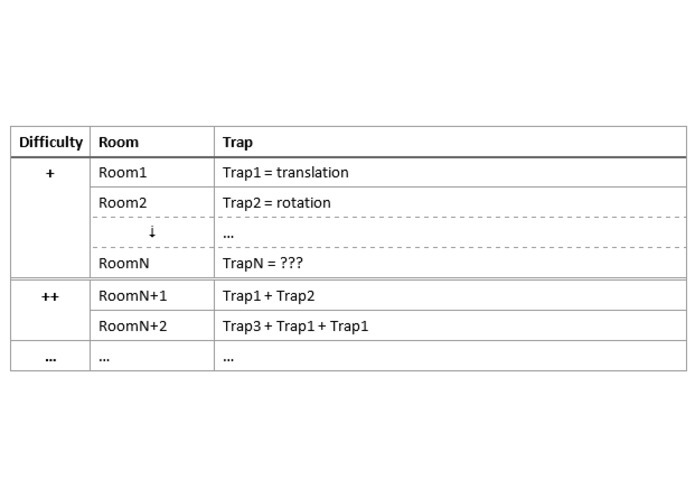 Transition system to switch between traps. Visual signature = distinctive visual style to best serve gameplay and game identity. Audio signature = same as visual signature but with... audio. Fix some game mechanics (especially SFX and checkpoint). A very important and secret step. Complete the UI system (would be great, but still optional). Polish, fix bug, polish, fix bug, repeat. Currently, the main problem is the lack of GearVR... The game is running fine on the GN4, at least. Now it is crucial to find someone to test it in-depth for cybersickness (this was considered since the beginning), ease of use, UI controls, etc. This is the main challenge now. 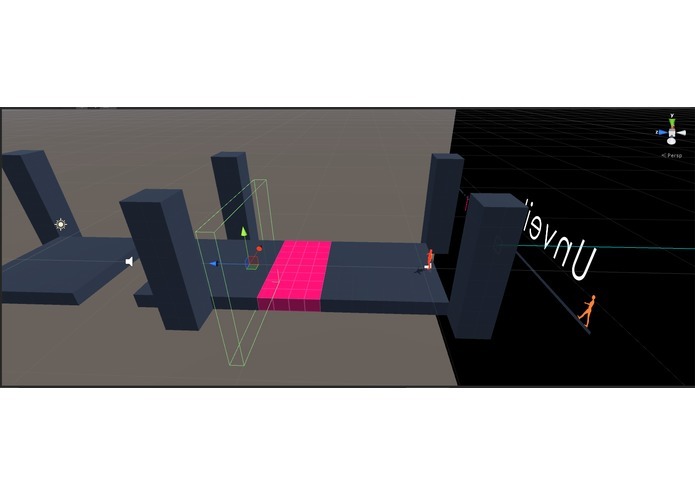 The concept scene is created and the first Obstacles can be tested. The challenges stay the same. Using Unity 5 with the Gear VR. Develop without the Gear VR (only GN4). Find an efficient way to display see-through objects. 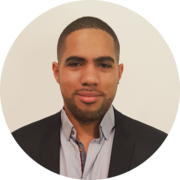 Virtual Reality fanatic (VR engineer at full-time), videogame dreamer (indie gamedev on free-time), geek spirit (geek always).